Ohh, baby, wasn't I the one who made you want to you? The prospect, however, fell apart and Gladys Knight's song and performance was chosen, later becoming a UK Top 10 hit. The song (one of the longest to ever be used in a Bond film) was composed by Narada Michael Walden, Jeffrey Cohen and Walter Afanasieff. It was based on the "horn line" from Goldfinger, which required royalty payments to the original writers. 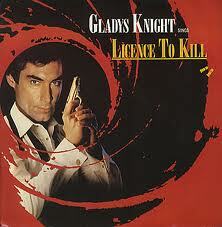 The music video of "Licence to Kill" was directed by Daniel Kleinman, who later took over the reins of title designer from Maurice Binder for the 1995 Bond film, GoldenEye. Licence to Kill (1989) is the sixteenth official entry in the James Bond series, and the first one not to use an Ian Fleming novel's title as its title. While enjoying a generally positive critical reception, it was the first James Bond film to be given a PG-13 rating in the United States and also the first to gain a 15 rating in the United Kingdom, being noted as significantly darker and more violent than its predecessors. Due to these issues, as well as marketing problems including a last minute title change, Licence to Kill had poor US box office returns, making just USD$34,667,015, barely more than its estimated USD$32,000,000 budget, though it performed well overseas.